It&apos;s been 19 years since the first episode of Buffy the Vampire Slayer aired, and now the star of the show, Sarah Michelle Gellar, is slaying it in the kitchen instead of graveyards. Gellar, 38, recently made the shift into the food and startup world with the October launch of her company Foodstirs, with her partners Galit Laibow and Gia Russo. 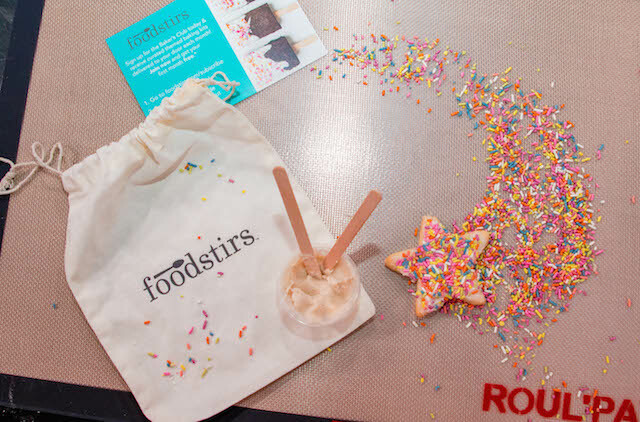 Foodstirs is a subscription-based service where you can get monthly, kid-friendly baking kits that come with a recipe, ingredients and materials you need to craft really Instagrammable desserts. We&apos;re talking about heart-shaped brownies on Popsicle sticks, cupcakes that look like ice cream scoops topped with sprinkles in an ice cream cone, and snowflake-shaped brownies with mini marshmallow toppings. As opposed to the boxed baking kits you&apos;ll find at the store, Gellar says theirs are made from scratch with no dyes, chemicals or preservatives. All the ingredients are also organic and vegan. LAist caught up with Gellar over the weekend at the four-day All-Star Chef Classic event at LA Live in downtown LA. She was host to a pizza cooking demonstration to 200 children led by pastry chef Sherry Yard (Helms Bakery). Kids donning chefs&apos; hats and aprons were assembling pizzas, with their parents lending a hand, in an impressive built-out stadium that felt akin to what I imagine being on an Iron Chef set was like. Gellar, now a brunette and rocking a black jumpsuit and denim jacket, was buzzing back and forth on the stage, getting on the mic, giving instructions and posing for photos with children. As with other recent events like LA Cookie Con, she&apos;s been promoting her Foodstirs product. At the end of the demonstration, children had a chance to use her kit to decorate star-shaped super cookies with frosting and sprinkles. 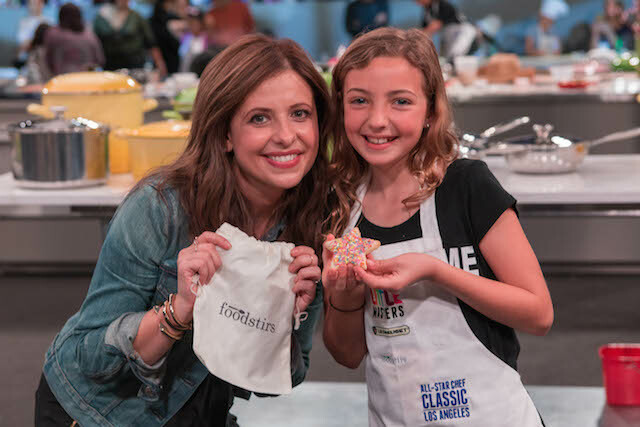 Her two kids from her marriage with longtime husband Freddy Prinze, Jr. were also there taking the Little Masters pizza-making course. Even celebrity chef Ludo Lefebvre (Trois Mec, Trois Familia) was in the audience with his two children, who were also learning how to cook. Gellar&apos;s not the only one in her family who&apos;s been dipping their toes in the food world. Prinze, 40, not only played an aspiring chef in rom-com Down To You, but he&apos;s actually quite the cook at home as well. Prinze, who once went to culinary school, is releasing his own cookbook later this year. However, Gellar tells LAist that Prinze wasn&apos;t the inspiration for her foray into food. "I would say my kids were my biggest inspiration more than anything. I would&apos;ve been fine just eating [my husband&apos;s] food for the rest of my life." Up until 10 years ago, Gellar says that her cooking background was just making reservations at a restaurant. "My mom was a great chef, so I sort of never bothered. And then once I had kids and realized how important it was and I realized that I was missing moments that my husband was getting with the kids, I got myself right in the kitchen." Gellar believes that it&apos;s important to get kids to cook because it teaches them science, math, vocabulary and fine motor skills. "But it&apos;s also a connection," she says. "We live in a society that&apos;s incredibly fast-paced. And it&apos;s really important that these kids have a moment for true connection. This is what gets passed down. Kids don&apos;t remember what movie you took them to or what park they went to. They remember those days when you made a cake or you made pizza. And you&apos;re setting up life skills for what they need for the rest of their lives." Foodstirs doesn&apos;t just end at the baking kits. Gellar is currently working a book about food crafting employing the same idea as her company of "getting kids involved in the kitchen and making food fun." That&apos;s expected to be released on Mother&apos;s Day of 2017. Gellar has spent the last two years with her team developing the formulas and recipes for the launch of Foodstirs, and while she&apos;s still working on that, she&apos;s now back in her other profession: acting. She&apos;s reprising her role as the vengeful Kathryn Merteuil in the TV adaptation of Cruel Intentions on the CW, a story that takes place 15 years after where the movie left off. And no, she hasn&apos;t forgotten her Buffy roots, as last week was the anniversary of the show. She Instagrammed a snapshot of her as Buffy holding a stake, with the caption, "19 years ago tonight, I got to introduce you to #buffyannesummers (and #mrpointy too) thank you for taking the incredible journey with me and continuing still. I am and forever will be #grateful"